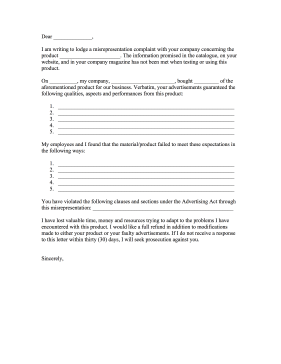 False advertisement and misrepresentation of a product are addressed in this printable complaint letter. I am writing to lodge a misrepresentation complaint with your company concerning the product ______________________. The information promised in the catalogue, on your website, and in your company magazine has not been met when testing or using this product. I have lost valuable time, money and resources trying to adapt to the problems I have encountered with this product. I would like a full refund in addition to modifications made to either your product or your faulty advertisements. If I do not receive a response to this letter within thirty (30) days, I will seek prosecution against you.